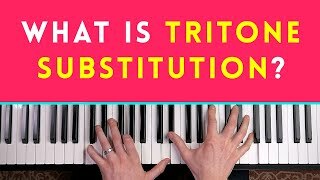 In this lesson I show you my favorite reharmonization technique - Tritone Substitution. Anytime you see a V7 chord in a jazz song (e.g. G7) you can transpose that V7 chord a tritone up (or down) and play Db7 instead. This sounds great in ii-V-I's (applied to the middle V7 chord), but you can also use it to precede a 'target chord' - so say you're about to play F min 7, then you could precede it with a Gb7. 1:04 What Is A Tritone?